Home > Kroger Ad > Campbell’s Condensed Cream Soup | 39¢ at Kroger! 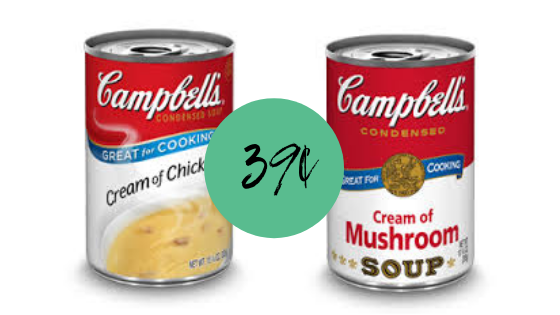 Campbell’s Condensed Cream Soup | 39¢ at Kroger! Stock up for the holidays! Campbell’s Cream Soup is on sale at Kroger for 49¢. Use a coupon from the paper and pick them up for just 39¢ each! And you can get a FREE ClickList pickup when you buy five General Mills or Campbell’s items with eCoupon.